Set of 4 Metlox Poppytrail dinner plates in the Tiffany pattern. Measuring 11" in diameter the colors are vibrant. 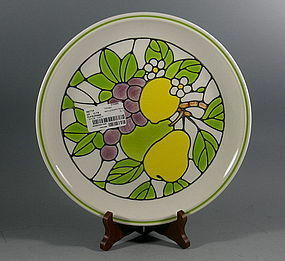 Marked on the back "Tiffany Poppytrail Metlox, Safe in Oven and Dishwasher, Durable, Hand Decorated, Made in Calif., U.S.A. 377." You will never find a set in as good condition as these four. They are perfect. Circa late 1976.